Brown and Caldwell, a leading environmental engineering and construction firm, today announced its selection by the Lower South Platte Water Conservancy District and other stakeholders to lead the South Platte Regional Water Development Study. The seventh fastest-growing state in 2018 per the U.S. Census Bureau, Colorado is expected to add three million new residents by 2050. In the rain shadow of the Rocky Mountains, the South Platte River Basin (basin), home to most of the state’s population, is challenged with the greatest projected water supply gap of any of Colorado’s river basins. The study will advance the South Platte Regional Water Development Concept, an initiative to bring municipal, environmental, and agricultural stakeholders together in new ways to manage and utilize water supply more effectively. It is potentially a pivotal step toward achieving the goals of the South Platte Basin Implementation Plan and Colorado’s Water Plan. The analysis will focus on partner outreach and the identification of supply alternatives that consider timing, amount, and location of stakeholder water needs, possible organizational structures, water treatment strategies, and other drivers deemed critical to the potential success of the project. The final report will equip water providers with the information required to advance the concept in a collaborative and transparent way. Initial concepts to be studied include multiple, operationally-linked storage facilities capable of storing more than 150,000 acre-feet of water and additional conveyance capacity strategically positioned throughout the basin. This infrastructure network will allow storage, reuse, and exchange of several water types including unappropriated native flow, reusable supplies, and agricultural water derived from alternative transfer methods. Water will be delivered to meet diverse municipal, agricultural, environmental, and recreational needs. “The study is a key driver to conserving, protecting, and enhancing water supplies as the basin continues to experience unprecedented growth and subsequent supply challenges,” said Joe Frank, Lower South Platte Water Conservancy District general manager. Directing a multi-disciplinary team, Brown and Caldwell will provide project oversight, coordinate a 60-strong stakeholder task force, evaluate agricultural requirements, and lead modeling. Stantec will integrate results of the South Platte Storage Study, a 2017 report detailing multi-purpose water storage possibilities in the Lower South Platte River basin. Cost estimating, organization structuring, and water treatment will also be part of Stantec’s remit. Leonard Rice Engineers will refine municipal, industrial, environmental, and recreational demands and support modeling. Sigler Communications has been engaged for stakeholder outreach. The team will be advised by Doug Robotham and attorneys from Holland & Hart. Project kickoff commenced in March with a draft of the final study scheduled for delivery within a year. Every year, an average of 142 billion gallons (436,000 acre-feet) of water slips down the South Platte River out of Colorado and into Nebraska. Right now, that water feeds into habitats of endangered fish and birds, but most of it could legally be diverted and used in Colorado instead. For decades, these escaping river flows — sometimes millions of acre feet of water more than Colorado is required to deliver to Nebraska — have been seen as a loss by Front Range water managers, but the hefty price tag of infrastructure to divert, store and move water has kept new projects from getting off the ground. Now, with communities struggling to bolster their supplies to feed the Denver metro area’s exploding population, a group in the South Platte basin thinks it can develop a regional plan to tap the river’s potential. 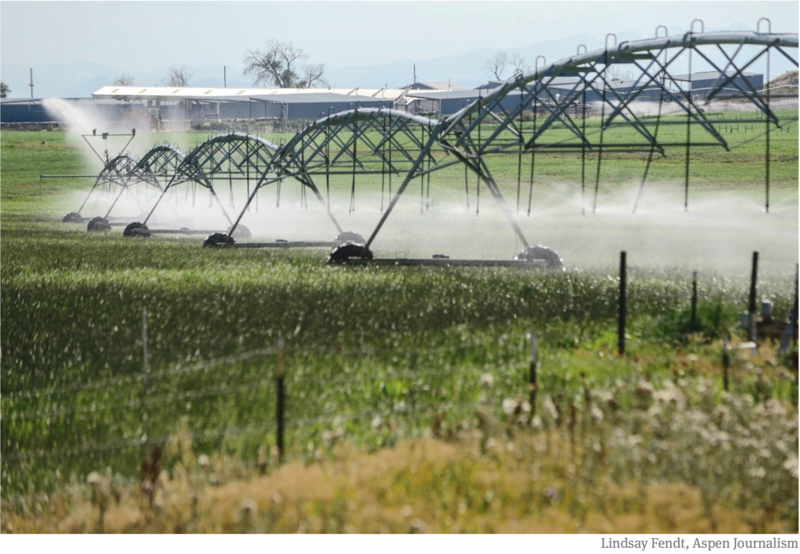 The infrastructure concept could provide a large chunk of the Front Range’s projected future water needs, and the concept’s designers say, if executed properly, the project would keep agricultural communities intact and create environmental benefits. Skeptics say it’s a costly plan that would further drain an already beleaguered river system. Constructing it would require billions of dollars and an unprecedented amount of cooperation among water users, but in today’s era of scarcity, Some water managers say it may be the simplest path forward. Despite the amount of Colorado water headed into Nebraska, water from the South Platte is still used on a huge scale. Diversion ditches from the river feed cities, agriculture and industry along the Front Range, including farms in Weld County east of Greeley, but not all the water applied to the land is consumed — about 50 percent of the water from flood irrigation seeps back into the river. Legally, these return flows can be reused downstream, but they aren’t always released back to the river in areas where they can be captured. And because much of the water is wastewater, its quality is often too low to be used as drinking water. These complications have made South Platte water an undesirable option for many municipalities, and growing cities have, instead, turned to water from the other side of the Continental Divide. This water is cleaner, less expensive due to existing infrastructure and can legally be used for any type of use without going through water court. But the use of Western Slope water on the Front Range has long drawn criticism from water officials on the other side of the mountains: They see such use as overuse of their resources. The under appreciation for South Platte water started to change in 2010, after the state released the Statewide Water Supply Initiative, a data analysis of Colorado’s water supplies and projected future demand. The study estimated that by 2050 Colorado would need between 310,000 and 560,000 more acre-feet of water than it can currently supply. About 50 to 60 percent of this water would be needed within the South Platte Basin, the fastest-growing part of the state. This anticipated supply gap forced Front Range water providers to consider new options. Around that time, Frank and six other water experts started holding informal meetings to discuss South Platte water supplies. The group became known as the South Platte Regional Opportunities Working Group. About the same time that group was meeting, the Colorado legislature also grew interested in the river. In 2016, the General Assembly ordered a study to determine how much Colorado water was entering Nebraska and to analyze possible water-storage projects to capture that flow. This South Platte Storage Study found that over a 20-year period, Colorado delivered nearly 8 million acre-feet of excess water to Nebraska. But while there was plenty of water available in the river, accessing it would be costly or environmentally damaging. The group took that information and — using funds from water providers such as Denver Water, Northern Water and Aurora Water — commissioned its own consultants. 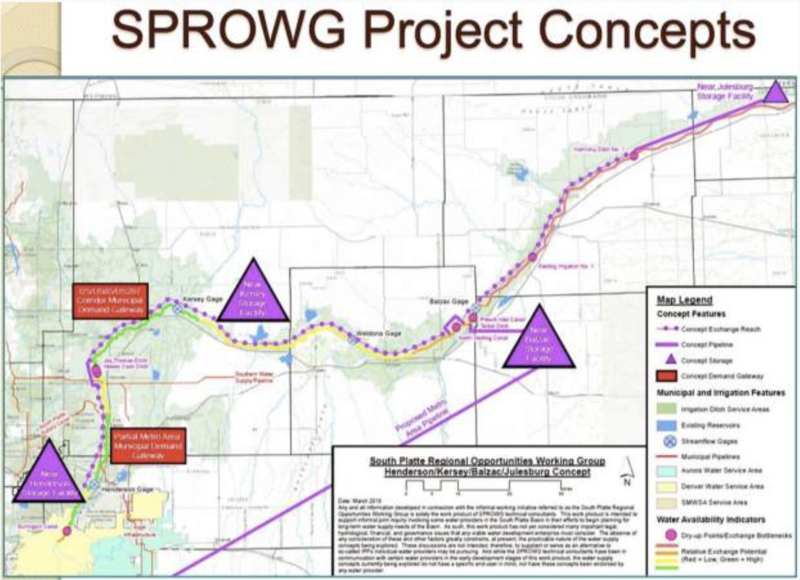 The group’s findings became known as the South Platte Regional Water Development Concept, and outlined a possible plan for a water system on the river. The current proposal includes three new storage facilities — near Henderson, Kersey and Balzac — and a pipeline from the Balzac facility to the metro Denver area. The concept’s designers say it could consistently provide 50,000 acre-feet of water every year. With a concept in hand, the group expanded into a task force, drawing about 40 volunteer members with varying interests in water. The task force is now using $390,000 in grant funding from the Colorado Conservation Board and the South Platte and Metro basin roundtables to hire consultants to analyze the project idea. Although much of the water that could fill the concept plan would be unappropriated return flows, some of it would probably need to come from agriculture. In the past, this was done by cities that purchased farms with senior water rights and fallowed the lands. If done on a large scale, the practice, known as “buy and dry,” can eliminate agricultural communities. Rather than promote buy-and-dry, the creators of the concept plan want to use alternative transfer methods to buy temporary water leases from farmers on an annual or seasonal basis. These agreements allow farmers to get money for their water without permanently drying up their farm. While alternative transfer methods are considered better for farmers, executing the agreements on a large scale requires infrastructure to move the water around. With three storage facilities near farmlands and a pipeline running to the Denver area, the South Platte concept could be used to facilitate alternative transfer methods. 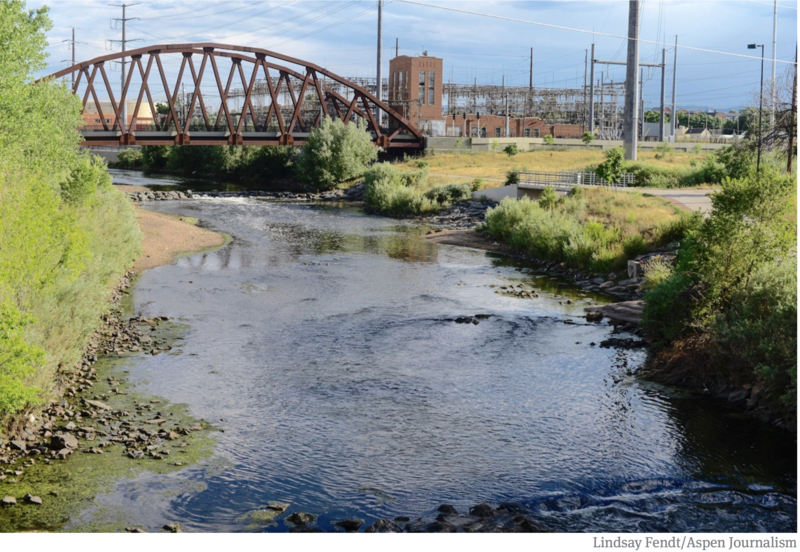 The South Platte River runs by a utility plant near I-25 in Denver. A group of Front Range water providers are working on a plan that includes up to 175,000 acre-feet of new water storage along the river. Because the concept plan is still in its early phases of development, most environmental groups have yet to release an opinion on the project. Still, there are concerns about depleting the flows of the South Platte or further degrading its waters. In hopes of reducing impacts, some environmental representatives have joined the concept plan task force to provide feedback. Frank said the promise of mitigation and environmental enhancements – improvements on the river made by water providers – have gotten several environmental groups “on board” with the project’s idea. As projected in the South Platte Storage Study, the costs to build the project would be huge. Although the project doesn’t yet carry a final price tag, initial estimates put the infrastructure costs at nearly $2.5 billion. This cost is undeniably high, but with water becoming a more expensive commodity, water providers say it’s an increasingly reasonable one to consider. The cost estimates show that water from the concept plan would cost about the same as building any other water project or buying into an existing one. For these reasons, many water providers in the Front Range are already exploring how they fit into the regional project. Editor’s note: Aspen Journalism covers rivers and water in collaboration with The Greeley Tribune and other Swift Communications newspapers. The Tribune published this story on Saturday, Nov. 26,2018.